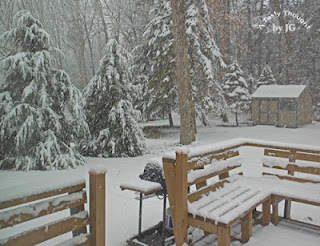 After our infamous Halloween Nor'easter in the fall, we've had a most pleasant winter! Mild temps and not much snowfall. Winter came and left in late October/ early November for us. 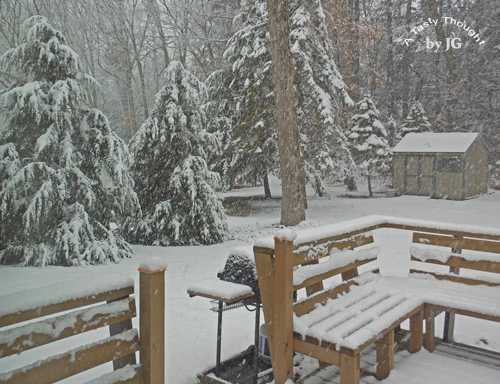 Skiers could travel north and enjoy the powder this winter, if they desired. My little grandson enjoys learning about animals, colors and just about everything else. The last time the little guy was over, "O-W-L" became the word of the day. Needless to say I remembered that cute little owl pattern in my "Sewing Projects" Bookmarks. 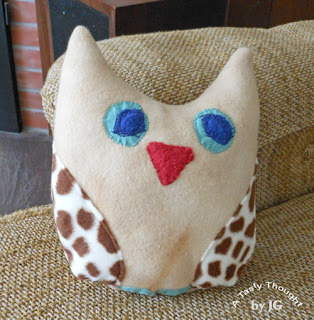 A few days ago we drove in to visit with a non pill fleece stuffed owl. It's about 9" in height - perfect for a little toddler's hands. And it's totally washable. I sure do remember that stuffed toys do land in the wierdest places. Do you remember those days? So often in the evening while the oven is preheating for that 20 minutes, everything is prepped. Just before the "NBC Nightly News" starts, the oven door is opened and our dinner is placed inside. Definitely a fave during the colder months is Baked Pork Tenderloin with Roasted Carrots. The meat is placed in the center of a large foil lined (sprayed with PAM) cookie pan. Then, Olive Oil/Herb coated Carrots are placed around the Pork Tenderloin. They are baked/roasted together! Easy + Yummy! When my local grocery store Big Y has a Pork Tenderloin special of "Buy 1 Get 1 Free", this is always one dinner we enjoy. While baking, the Pork Tenderloin rests on 2-3 Bay Leaves and is covered with a sprinkling of Oregano + Rosemary Leaves. Delicious! Couple that with Roasted Carrots and the aromas from our kitchen beckon us to dinner after we learn the news of the day. Line a large cookie pan with foil. Rinse Carrots in cold water. Place Carrots in a Gallon sized Ziploc Freezer bag that contains 3 Tablespoons Olive Oil, 1/4 teaspoon each of Basil, Oregano, Garlic Powder and also Black Pepper and coat. 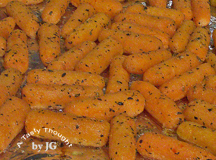 Place coated Carrots on outer sides of foil lined cookie pan. Tongs work well to place coated Carrots on pan. No sticky fingers. Pork Tenderloin - about 1 and 1/4 lbs. Place 2-3 Bay Leaves in center of cookie pan where Tenderloin will be placed. Rinse Tenderloin in cold water. Place Tenderloin on Bay Leaves. Drizzle about 1-2 teaspoons Olive Oil on top of Tenderloin. Sprinkle 1/4 teaspoon Oregano on Tenderloin. Sprinkle 1 teaspoon Rosemary Leaves on Tenderloin. Bake the Pork Tenderloin + the Carrots in 425°F oven for 40 minutes. After removing from oven, cover with foil and let sit/rest for 5 minutes. Then, remove Pork Tenderloin and cut into slices. The roasted colorful Carrots are a delicious veggie bursting with flavor. Sometimes, Easy Cheesy Noodles round out this yummy colorful dinner! Mmmmm! I also enjoy a little Mustard as a dipping sauce for pieces of sliced Pork Tenderloin! Do you like mustard? This weekend I wanted to prepare a breakfast that we'd enjoy and also place any extras in our freezer for Tuesday morning. It did not take too long to decide what breakfast to prepare. One of my My husband's fave breakfast in the world is Blueberry Buttermilk Pancakes! Light Buttermilk pancakes flavored with Cinnamon and a bit of Nutmeg. Combine that with Blueberries = YUM! Third Blueberry Buttermilk Pancake ready to Flip over! After Breakfast and the extra pancakes have cooled I place each in a sandwich bag and then stack them in a Ziploc Freezer Bag. Into our freezer they go to enjoy other mornings. This works great! 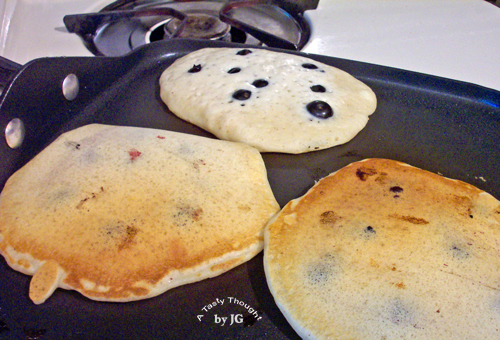 The Blueberry Buttermilk Pancakes will taste wonderful tomorrow morning! The Blueberries are defrosting in our fridge. As a matter of fact I do know what we will enjoy on Valentine's Day for breakfast! Chicken served in a variety of dishes is quite often on our dinner table. Two weeks ago there was a great special at our local grocery store, the Big Y. Packages of boneless skinless chicken breasts were Buy 1, Get 1. That was a great purchase! Right away I knew that one package would be marinated and we'd enjoy Grilled Chicken Medley. The Penne, the cheese and the veggies were in our fridge. O.K., I know it's winter, but a tasty, tangy, nutritious, colorful salad tastes great any time of the year! Ohh, there was one large extra piece of flavored chicken left after I prepared our colorful dinner salads. Sweet! This would become an ingredient in another delicious meal two days later. Chicken Enchiladas! Yum! Once again, most of the ingredients are readily available in our fridge. Usually when I read recipes for Chicken Enchiladas, the chicken is prepared just before rolling up the tortillas. 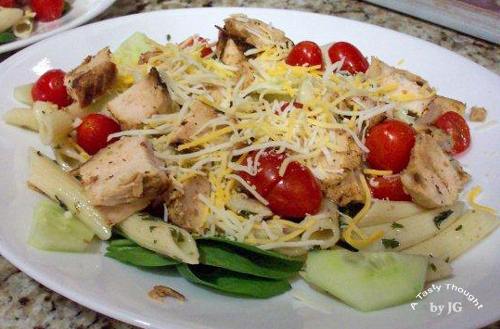 Using cooked chicken from another delicious meal works so well! Easy! Our Enchiladas had a Peruvian flavor and they were delicious! Yes, the chicken can be cooked just before using, but who always has time? 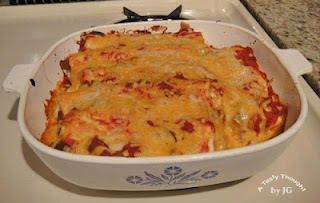 The recipe I use is adapted from Debbie Donham's recipe for Chicken Enchiladas I on allrecipes.com. Spray a Baking Dish (about 10" square) with PAM. Place about 1/4 Cup Salsa in Baking Dish. Spread. Cut cooked Chicken into very small pieces. Place Onion, Sour Cream, 1 Cup Taco Cheese, Parsley, Oregano, Black Pepper and Chili Powder in small bowl. Add Chicken pieces. Combine. Dividing mixture evenly between the 6 Tortillas, place an amount in center of Tortilla. Spread in middle leaving borders. Fold over about 1" of tortilla on left and right sides. Roll tortilla starting from end nearest you and place in Baking Dish, seam side down. Pour remaining Salsa over top, covering ends of Enchiladas. Spread Salsa over top. Spread 3/4 Cup Taco Cheese on Enchiladas. Bake uncovered in 350°F oven for 28 Minutes. This has become my new "go to " meal whenever we have any extra cooked chicken after dinner. Who would guess that this great dinner is made from "leftovers"? 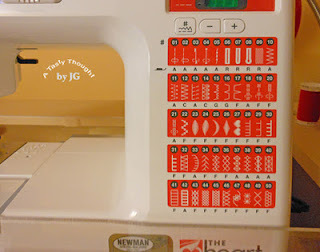 I had been glancing over at the decorative stitch panel on my Janome sewing machine whenever I walked into my sewing/computer room. Plans were in the works. It took little time to locate the two new, fluffy, hand towels that had been purchased from Kohl's. They had been washed/dried and were ready to use. 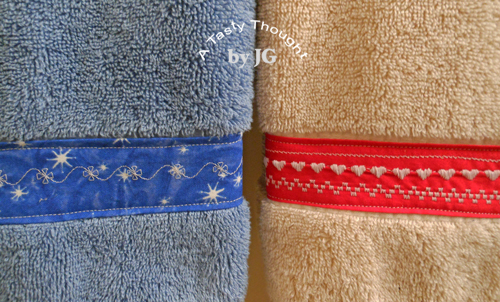 During the Christmas holiday season our guest towels were quite festive whenever we walked into our bathroom. They have been cleaned and packed away. Ahh! 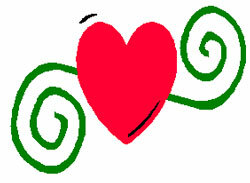 Valentine's Day is approaching! It was time to sit down and use my Janome! The needed directions were recalled quickly. The recessed areas near the towels' bottom edges are a different size than my "Christmas Guest Towels", but the area should be measured each time, anyway. My scrap stash is always nearby, so I had fun! This is a wonderful way to learn more about and to use the decorative stitches on my sewing machine! Now, what is the next holiday??? Mmmm!